We have met the Government Conspiracy, and it is us! The main characters are The Government (or at least part of it) - in The White House, Whitehall, the Governor's mansion, a Covert Group, or bureaucrats elsewhere. Variations range from Sitcom to Prime Time Soap with political trappings to topical Ripped from the Headlines drama. A Law Procedural with government attorneys as the main protagonists is a subgenre. See Spy Drama for espionage themed stuff. See also Police Procedural and Cop Show for law enforcement portrayals. If the story is more of a character drama focusing on one leader in particular, see Ruler Protagonist. The main events of Flaihhsam s'Spahkh are something of a government procedural set in the Romulan Imperial Senate. In Origins, a Mass Effect/Star Wars/Borderlands/Halo Massive Multiplayer Crossover, there's a Plot Thread dealing with issues in the Home Galaxy Senate—mainly, an agency looking increasingly like State Sec is pushing the boundaries of acceptable experimentation while consolidating more and more power. A Senator is trying to at least shine a light in, though so far there hasn't been much in the way of results. The American President combines this with a Romantic Comedy. Conspiracy is a really sinister version of this, about a meeting between a group of German government officials in 1942... planning the Holocaust. Gabriel Over the White House: a very odd example of the genre in which the President becomes a fascist dictator...and that's supposed to be a good thing. In the Loop concerns factions within the British and American governments colluding to start the War on Terror. Lincoln: Abraham Lincoln's efforts to get the 13th Amendment passed and end slavery in the United States forever. 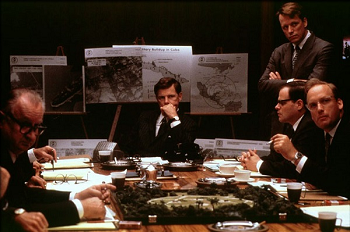 Thirteen Days: the Kennedy administration deals with the Cuban Missile Crisis. Contagion: is basically a look at how the CDC, as a government agency, would operate in the face of a supervirus. Local and federal bureaucracy occasionally becomes a problem. EarthCent Ambassador is a foreign service version of this, Played for Laughs. One of the two leads is the ambassador for EarthCent on Union Station, operated by a race of Benevolent AIs called the Stryx. To a degree, Going Postal, and even more so Making Money. When the plot doesn't center on the military action, much of the plot of the Honor Harrington series busies itself with the intricate workings of the various governments involved, and occasionally gives the impression that the military commanders have a less stressful job than the politicians do (Some of the politicians certainly think so, at least). Manticore Ascendant, a prequel series to Honor Harrington, continues the trend of Manticoran politics being at least as ruthless as interstellar warfare. A Song of Ice and Fire: It's about politics in the Seven Kingdoms... with some focus outside it when necessary, battles, dragons, zombies and other magic that occasionally show up to just make the politics much, much more complicated. Mainly, though: the fascinatingly convoluted politics of the Seven Kingdoms. Star Trek: Articles of the Federation takes its name from the United Federation of Planets' version of the Constitution, and deals heavily with Federation internal politics and foreign policy, beginning with the inauguration of Nanietta Bacco as President. The author compared it to Star Trek meets The West Wing. The war-themed epic thriller Victoria includes heavy elements of this, with political planning and machinations (within both the civilian government and the General Staff) as important to the story as the military action itself. 24 a heavily actionized political thriller where the US President is always deeply involved. Babylon 5 in its first season, before the big fantasy-influenced plot arcs got going, although the politics remained extremely important even then. Borgen, which is about a fictional female prime minister of Denmark and her staff, allies, and rivals. The Crown (2016), with Elizabeth II learning to take on the responsibilities of the Crown at the increasing cost of her personal happiness, and the struggles of her Prime Ministers, beginning with Sirs Winston Churchill and Anthony Eden. Designated Survivor, the 13th member in the United States presidential line of succession becomes President. Game of Thrones: As with its counterpart A Song of Ice and Fire, above. Yes, it's a fantasy. Which spends an awful lot of time painstakingly demonstrating why living in a land (mis)governed like the Seven Kingdoms currently is being... is a little too "interesting" for comfort. Saying you're watching it for the politics is actually believable in this instance. House of Cards (UK) concerns an ambitious Conservative Party whip maneuvering to rise to Prime-Ministership. House of Cards (US) concerns an ambitious Democratic Party whip maneuvering to rise to Presidency. JAG, protagonists are government attorneys. Kings, centered around a fictional Deadly Decadent Court in a modern setting. Madam Secretary has the US Secretary of State, a former CIA officer named Elizabeth McCord, as its protagonist, and deals with both foreign and domestic policy. Parks and Recreation—An odd one in that it focuses on small-town local government, with a bureaucrat as the central character—albeit a bureaucrat who was for a time a member of the City Council and would eventually become Governor of Indiana and (we think) President of the United States. Show Me A Hero, a miniseries about the Yonkers housing controversy of the late 20th century. The Thick of It— a sitcom about civil servants in a minor British government department making life hell for each other. Utopia (2014) is a comedy about the "Nation Building Authority", a newly created government organization responsible for overseeing major infrastructure projects. Veep—A sitcom about (what else) the Vice President of the United States and how useless she is. At least at first... Despite coming from the same person (Armando Iannucci) as The Thick of It, the characters do not usually intentionally make life hell for each other, and attempts at scheming usually backfire. The West Wing is the Trope Codifier, centring around a fictional US President and his staff. The Wire: The police and politics plot lines concern government procedure. Yes, Minister (and its sequel, Yes, Prime Minister), a sitcom about the British government and civil service. Bayan Ko is one for a provincial Philippine small town, with its mayor as the Ruler Protagonist. 1776. Jockeying for votes: The Musical! All the Way — About Lyndon Johnson's crusade to pass the Civil Rights Act. Both Your Houses: All the ugly deal-making that goes into getting a bloated appropriations bill passed. Of Thee I Sing: A very silly version that revolves around the President getting a girlfriend. Crusader Kings and its sequel are fundamentally politics simulators set in The Middle Ages, driven by random events and every single ruler's opinion of each other. The Tropico series, a tongue-in-cheek banana republic simulator. Urban Empire, described as House of Cards (US) meets SimCity. Xenoblade Chronicles 2 has shades of this. A lot of time is spent watching the machinations of the major governments, and several officials from them join the party.